With multiple deck heights and bore sizes up to 4.600”, the Big M Sportsman block gives you the versatility to build a wide variety of engine combinations. A true priority main oiling system oils the main bearings before the lifters for extra reliability. 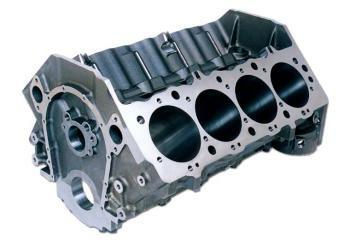 Standard 9.800” and tall 10.200” deck heights available for stroker engines. Standard 4.250” , 4.500” or 4.600” bore sizes with siamesed extra thick cylinder walls to resist cracking and improve ring seal (minimum .300” thick with 4.625” bore). Uses +.300” tall Gen VI style lifters. Modification for Gen IV style available. Scalloped outer water jacket walls improve coolant flow around the cylinder barrels to equalize temperatures. 2 bolt front and rear and 4 bolt interior ductile iron main caps have splayed outer bolts for extra strength – OR – 4 bolt billet steel main caps have splayed outer bolts for extra strength. Crankshaft tunnel has clearance for a 4.500” stroke crank with steel rods without grinding. True priority main oil system lubricates the main bearings before the lifters. Our stepped main oil gallery (9/16” to 1/2” to 7/16”) increases the flow of oil to the crank at high rpm, and our front oil crossover eliminates internal oil leaks around the distributor shaft. Oil filter pad is drilled and tapped for an external oil pump. Available in traditional Gen IV style, or in Gen V or Gen VI style with one piece rear seal. Lifter valley head stud bosses prevent blown head gaskets. Rear main cap uses standard oil pump and two piece seal – no adapter required! Mechanical fuel pump boss, clutch linkage mounts, and side and front motor mounts simplify installation in any chassis. Dual oil pan bolt patterns fit standard and notched oil pans. Coated cam bearings, freeze plugs and dowels are included.